Do your teeth look longer than they used to? Do you experience sensitivity when you eat ice cream or drink coffee? These are signs that you may have receding gums. Gum recession is a common oral health condition. It occurs when the soft tissues that support your teeth recess or lower down from their proper position on the tooth. 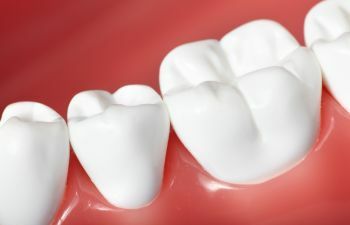 This exposes the tooth root, which leaves the tooth more vulnerable to sensitivity and can also compromise the stability of the tooth if severe. Believe it or not, brusher harder does not equal brushing better. In fact, a gentle force with your toothbrush and floss is all that is needed to dislodge food debris and plaque. A soft bristled toothbrush is also recommended. If you are scrubbing your teeth aggressively, this may be the cause of your gum recession. You may be able to blame your parents for your receding gums. Just like other parts of your body, the characteristics of your gums can be inherited. Misalignment can cause abnormal pressure on the gums, making them recede over time. If you notice gum recession along with morning headaches or a sore jaw, the culprit may be nighttime teeth grinding. A custom nightguard can protect your teeth, gums and jaw from this harmful habit. A direct injury to a tooth can also lead to gum recession around the affected tooth. Restoring the tooth is a primary concern. Last but certainly not least, gum recession can be a warning sign of periodontal disease. At this stage, the infection needs to be treated promptly to prevent further recession, bone loss and tooth loss. Need a trusted dentist to evaluate your receding gums? At Gold Hill Dentistry, we can not only diagnose the cause of your gum recession, but we can recommend an effective treatment plan to restore your gums. Call today to learn your options!